So one of the breweries I really liked last year was Salt Lake City's Uinta (you-in-tah) Brewing Company. a symbol that closely represents the meaning behind the name “Uinta” and exemplifies character of the company, as well. Uinta Brewing Company, established in 1993, was named after the Uinta Mountain Range, the only major East-West running mountain range in the continental United States. To celebrate the uniqueness of its namesake, the new logo depicts a mountain range circumscribed by a compass dial highlighting the East and West coordinates. The Compass is a tool which represents Uinta Brewing in several ways. The Uinta family prides itself on its sense of direction and focus on brewing quality, consistent beers... The compass speaks closely to the Uinta family’s sense of adventure and exploration, inside and outside of the brewery... 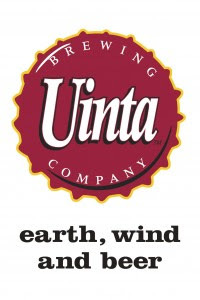 The tagline, “Earth, Wind and Beer”, will remain married to Uinta’s logo, as it speaks directly to the responsible business practices with which Uinta is genuinely concerned: sustainability, commitment to renewable energy, and of course, crafting great beer. Yeah, that was probably overdue for a facelift. The whole bottle cap thing seemed like a better idea to everyone a few years or decades ago. This is a major and needed step for a brand doing good stuff. Anyway, that overhaul was followed by a complete redesign of all the beers. Inspired by an upcoming 20th anniversary, Uinta Brewery sought a fresh approach in showcasing its products while maintaining the classic Uinta feel which reflects an appreciation for the outdoors and the timeless beauty of the mountain west. The process enabled Uinta to clearly define three lines of beers under the Uinta Family: the Classic Line, Organic Line and Crooked Line. Uinta designed a custom, proprietary 12 ounce bottle as part of the redesign project. Referred to as the “compass bottle,” the new bottle shape is branded by a 360-degree compass embossed into the bottle’s shoulder. Hmm, interesting. Still follows the classic look but slightly different. The compass alone wouldn't do much for me, but the change in shape is an interesting enough twist that I'm intrigued. Naturally, adopting the proprietary bottle gave rise to the need for a substantial investment in new bottling line equipment. I think we have a winner for understatement of the year. Changing bottles is enough to really mess up production for a while, and I can only imagine what going to proprietary bottles does to your packaging line, from fill to case. Looks like the vertical might be the same measurement, so that could alleviate some issues, but at least new labelers and such. Suffice it to say that is a serious amount of money to sink into something. Let's take a look at the beers themselves, keeping in mind: "The process enabled Uinta to clearly define three lines of beers under the Uinta Family: the Classic Line, Organic Line and Crooked Line... Additionally, as its beer names portray, Uinta appreciates the great outdoors that surround them in Utah and the entire Intermountain West." Hikers or skiers making their way to a lovely tree. Man, this earthtone-drenched brown ale has a label so crunchy you can taste the granola. But that's the identity of the brewery (they've been 100% wind-powered since 2001, when no one even cared about that stuff), and so this makes perfect sense. The Classic Line labels follow the same look and layout (hey, branding!) but have different colors and specifics (hey, product lines! ), but the art is clean and simple, and well-styled. The Golden Spike is the Hefeweizen that honors the connecting of the Transcontinental Railroad. Again, notable for the good use of complementary colors and the solid design. Perspective on the train isn't perfect, but the stylized look makes it work. I like asymmetry, but this label is really top-left heavy, with a train there and just some tracks in the lower right. Lots of green, obviously, and I like how the hop is both central but not overpowering. It seems part of the overall environmental look, which is appropriate. The compass is back, which is good to see, but the waves behind it look a little strange in the green. Still, they're basically accents and the label as a whole is nice piece. The left panel is still there, but the design is different. These all share the same font, with a monochrome background and a one- or two-color small image under the lettering. The simplicity highlights the organic quality in two ways. One is that the lack of extraneous things in the label suggests the lack of unnecessary (i.e. non-organic) ingredients in the beer. The other is far more practical: There is less to distract from that all-important USDA circle, and so it really pops out from the background. There are many quibbles to be had with the standards for Organic, but the reality is that any certification for which one must apply is something to which one can draw attention. There are several organic beers, but clearly Uinta wants this to be a major part of their nature-focused identity, and they want you to know that part of what you're paying for is their commitment to natural life. All in all, I think the redesign is a very striking and successful for a brewery that, currently in 22 states, seems to be looking to take a step forward as a national brand. What font do they use?